It is 1891 and the massacre of Wounded Knee has already occurred and there are many strange, dangerous things going on in the territory. Men have slaughtered another man, wolves have viciously hunted in packs, and there’s an ill wind blowing, creating much fear at the nearby fort and throughout the area. Seeing a connection between all the terrible things happening is doctor Charles Zimmerman. Zimmerman gathers together a handful of unlikely heroes – a orphaned farm girl, a stage-coach robber, an un-lucky Lakota, and a medicine woman. Saving both the town of White Pine AND the Lakota community might be just too much to ask of these poor souls. Death Wind has an incredibly strong opening that will grab the reader and shake them a bit as if to say “This is not your ordinary western romance fiction novel!” We are plopped down in the middle of some tremendous action and the anticipation is high. Likewise, the ending comes along strong and fierce and we are caught up in a maelstrom of violent, wicked activity rising to a frenetic climax. But the middle portion of the book cannot hold this fever, even though it tries. At its core, this is a horror novel. I’ve written before, and believe it to be true, that horror is extremely difficult to sustain for an entire novel, which is why those who can do it well continue to leap to the top of the best seller lists. Authors Travis Heermann and Jim Pinto don’t quite get there. In order to maintain a horrific sense throughout the book, actions are repeated. Not the same action and not to the same person, but the same concept is used. ‘Something bad is happening to Person A, but before we get to the climax…” ‘Something bad is happening to Person B, but before we get to the climax…’ ‘Something bad is happening to Person C, but before we get to the climax…’ … you get the picture. I began to get quite bored with the book, wondering if anything really new was ever going to happen. It did, and it was wonderful, but by then the book had really lost me. This is a wonderful short story or novelette that was unfortunately expanded to novel length. Looking for a good book? 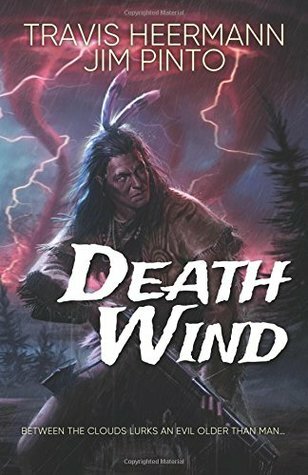 Death Wind by Travis Heermann and Jim Pinto explores horror in the old west but could have done it better by cutting a third of the book.